Last week I was in Sao Paulo, Brazil to teach trainers, athletes and fitness buffs how to build a better body. On my day off I flew to Rio de Janeiro to check out the sun, surf, and bikinis. While I was roaming around Ipanema Beach in a somewhat dehydrated state, I was relieved to see a cool little stand that sold coconut water, straight from the source. After mumbling through enough Portuguese to get my order across to the distracted Brazilian dude working the hut, he grabbed a young coconut, chopped off the top with what appeared to be a machete, and stuck a straw in the opening. I handed him a few reais and off I went because I didn’t want to find out what other uses he might have for that machete. 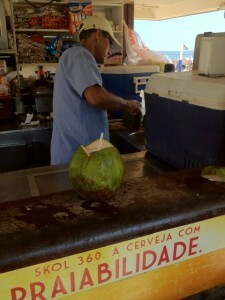 Coconut water is readily available in Rio and it’s as much a part of their culture as iced tea is to America. In Brazil, there aren’t any outrageous claims with regard to the purported health benefits, and that was a refreshing change from what I’ve been seeing around Los Angeles. I’ve been prescribing fresh coconut water as part of my athlete’s daily nutrition program for years and the results have been excellent. But as soon as marketers get their hands on a product with a few health benefits, everything goes to hell. I was reminded of this fact when a friend recently told me that she tried coconut water and it “didn’t do anything.” I’m not exactly sure what she intended it to do, but it’s likely that she read some outrageous claim like it can fix cancer, obesity, diabetes or something along those lines. And it doesn’t help matters when ConsumerLab found that two of the leading brands made label claims that didn’t hold up under testing, as reported last year by the NY Times. Nevertheless, coconut water’s role is simple: hydration. Now, I believe that coconut water benefits your body and performance beyond hydration, but I’d only be guessing what those other benefits could be since it’s too early to say. However, I know it’s better than water and any other popular sports drinks that are tainted with neon coloring and chemical additives. And don’t believe the sparse research from obscure journals that claim water, coconut water, and sports drinks are the same since they all equally restored the amount of body weight that was lost through training. Adequate hydration is considerably more complex than just restoring your body weight. Blood tests should have been performed to measure electrolytes, as well as tests of reaction times, cognition, etc. to get a clearer picture. Those are the factors that matter when it comes to performance, and fresh coconut water surely ranks best when compared to water or neon sports drinks. How can I say this? Because the nutrients in fresh coconut water are in their natural form, paired with all the other known and unknown compounds that increase assimilation. This is why it’s shown that people who eat a lot of citrus fruits are healthier than those who take a lab-made multivitamin with similar nutrients. And this is exactly why fresh coconut water beats regular water or Jolly Rancher flavored sports drinks. It’s also the reason why the only multivitamin that I use with clients is plant-based. You can find that excellent multivitamin at this link. Is coconut water perfect for athletes? Probably not since it doesn’t contain enough sodium to replenish your needs when you’ve been sweating heavily. Indeed, sodium is the electrolyte we lose most when sweating and coconut water doesn’t contain much of it. But the solution is as simple as adding a pinch of salt to each 16 ounce bottle – that’s what I have my athletes do before and after intense training. The catch, however, is that we all don’t live on Ipanema Beach where fresh coconut water is readily available in little huts. 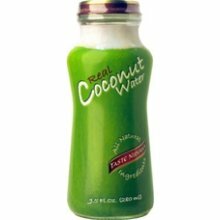 Nevertheless, Whole Foods and some other progressive health food stores sell what I consider to be the best tasting coconut water on the market: Taste Nirvana’s Real Coconut Water. If you want to know what coconut water is supposed to taste like, pick up a glass-bottled version of Taste Nirvana. There’s nothing in it but pure coconut water, unlike those sour-tasting versions that are sold in gas stations and liquor stores that contain additives to preserve shelf life. When I’m working with athletes that are in an intense training phase leading up to a competition, I’ll have them start their day with 16 ounces of fresh coconut water with a pinch of salt added. You can also use it before and/or after intense training when you sweat a lot. Finally, the time I consider coconut water to be invaluable is immediately after my fighters weigh-in for a competition. As soon as he or she steps off the scale, 32 ounces of coconut water with a few pinches of salt jumpstarts rehydration and ensures that they’re one step closer to being able to fight with fury the next day. Don’t we all want the magic pill to do wonderful things for our bodies? Coconut water hydrates while supplying natural nutrients. That in itself is pretty magical. In addition, a little flavor helps a beverage go down better compared to plain old water. Regarding vitamins, do you think pairing Biotest’s Super Food with their Elite Mineral’s is adequate when compared to taking a multivitamin like Ori offers? I take a scoop or two of Superfood during my daily fast, eat veggies and salad for dinner, and have a fruit based whey protein shake an hour or 2 after dinner. Do you think I am covering all/most the bases? CW: That plan sounds fine. However, Ori doesn’t recommend supplementing with selenium. You have mentioned sipping on some warmed-up coconut oil in the past as a way to get some natural energy and burn fat through the MCTs, how does the oil compare to the water? I usually put a tablespoon of organic coconut oil in my smoothies, but haven’t really sipped on it. Is it more concentrated for energy and the coconut water is better for hydration? Something tells me the water would be too expensive to drink daily, maybe more of a special occasion or after an intense workout as you mentioned above. I’ll have to see if the Vitamin Cottage carries the Real Coconut Water. CW: Yes, for the complete benefit of coconut, what you’re doing with the oil is best. However, for hydration coconut water with a little salt is ideal. I have only been drinking fresh coconut water because I absolutely love the taste of it. I just spent the past 8 months living in Thailand so I was drinking coconut water everyday. I never thought of it so much as something I could use before and after training. But now you got my brain thinking 🙂 So when I head back overseas I’m going to go with your suggestion for putting in a pinch of salt in the coconut water before drinking it to get fully re-hydrated. Hey Chad, I spent 10 months training in Thailand and coconut water saved me. 6 hours a day of thai boxing training in 40°C weather and 100% humidity takes its toll. It felt like drinking the magic potion from Asterix and Obelix, immediately energised and rehydrated. I havent found anything quite like it! Hey Chad, from your last article with the interview with Ori near the end you suggest 6 caps, on the product page it says only 2? Do you recommend starting with 6 a day for a while then cycling down to 2? CW: I recommmend 6 capsules per day if you have stubborn fat to burn. 2 is only for maintenance when your fat burning is at its peak.